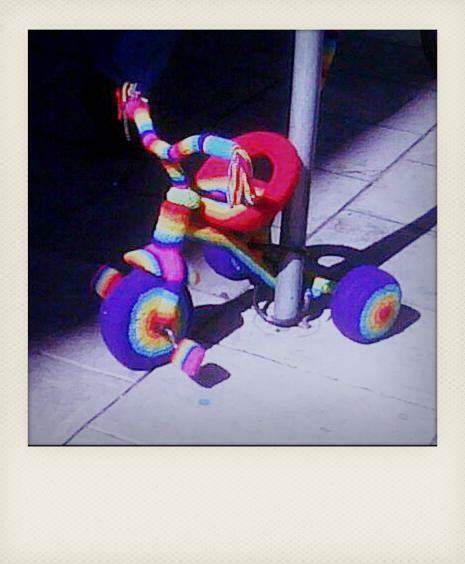 This sly little street racer is one of many that decked the sidewalks of Rundle street Adelaide this january as part of the ‘BIKE SA’ ‘BIKE ART’ show. 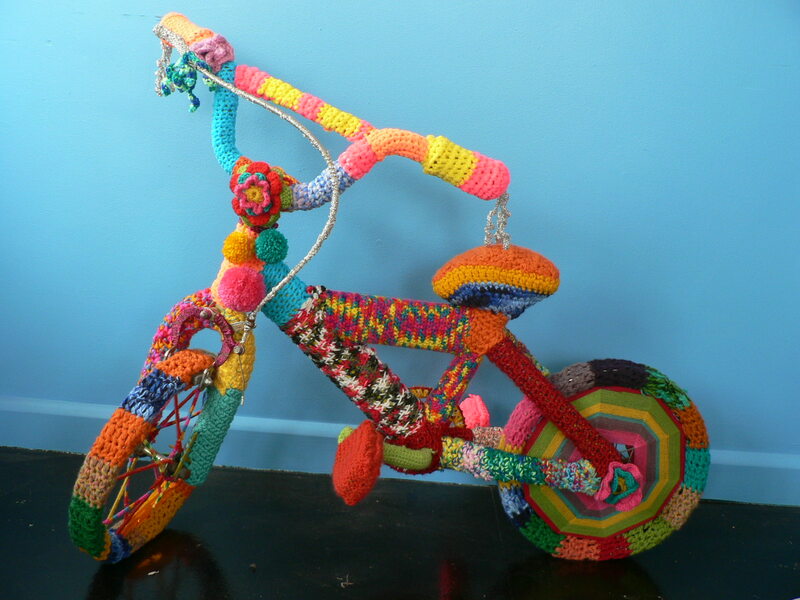 South Australians had their knitting needles clicking & their crochet hooks hooking in order to create the best selection of yarn bombed bikes that I’ve ever seen in one place. 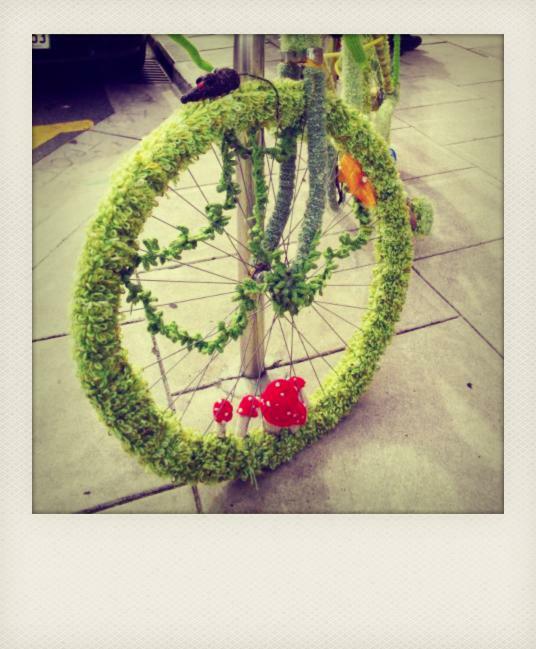 The attention to detail in these bikes is amazing. 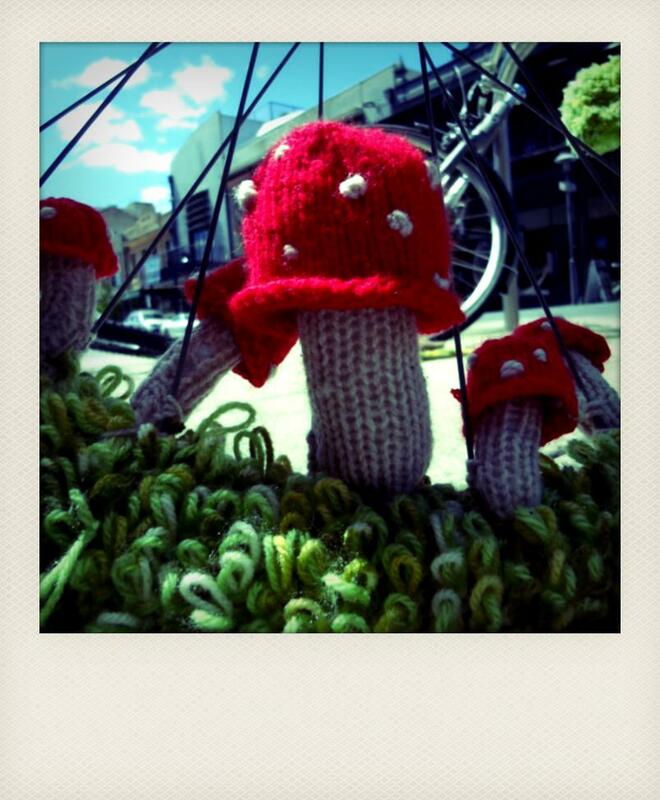 These little crochet mushrooms are a revelation of style on a utilitarian object or, in plain english, they are sooooo cute. 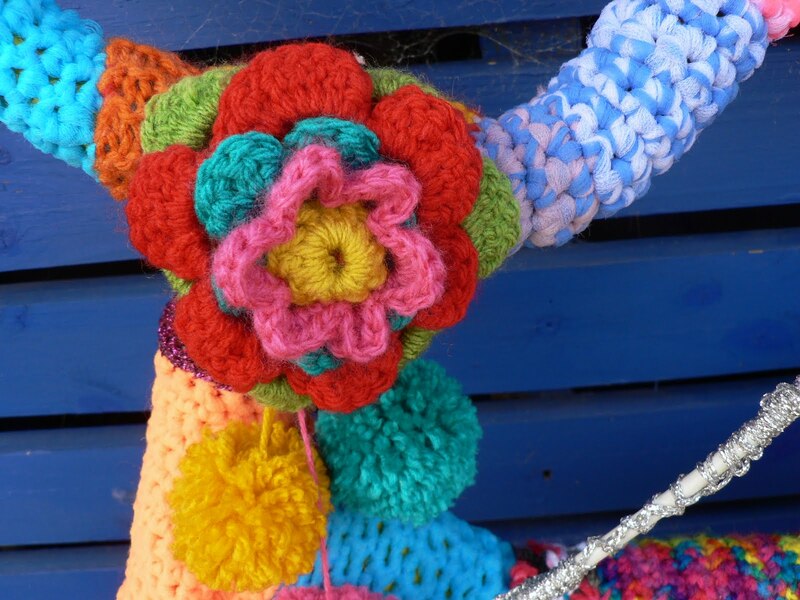 How could these candy coloured mushrooms not make you smile? 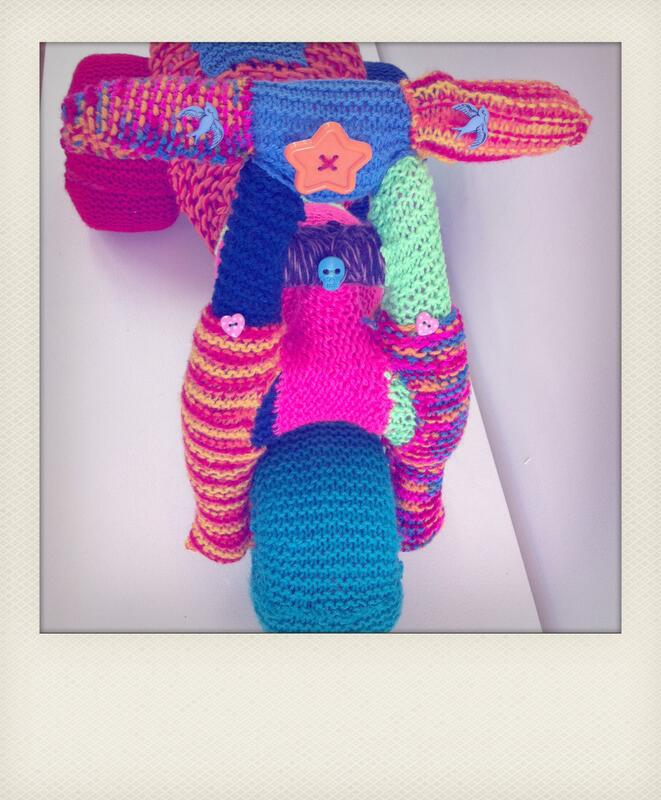 The plucky little speedster. 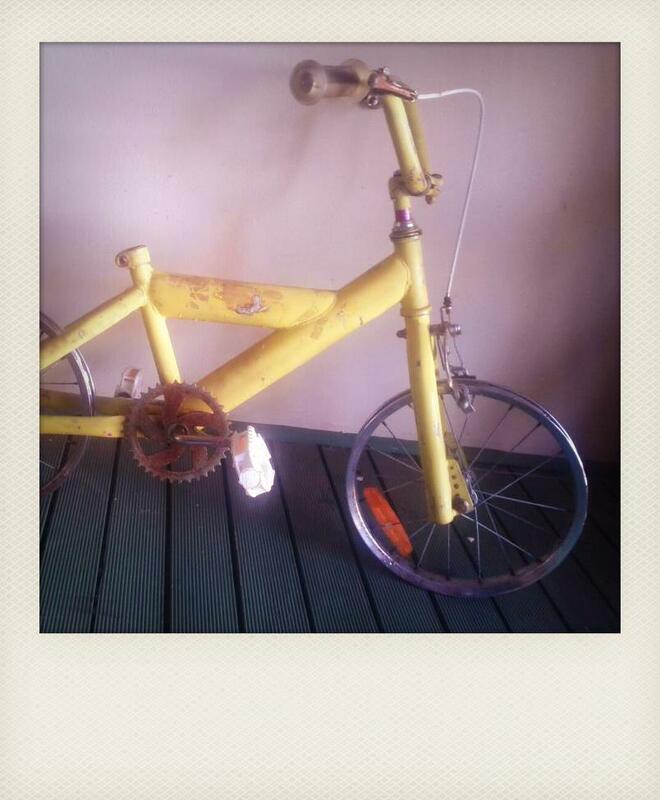 This pint sized bike was stolen, but miraculously it was returned. 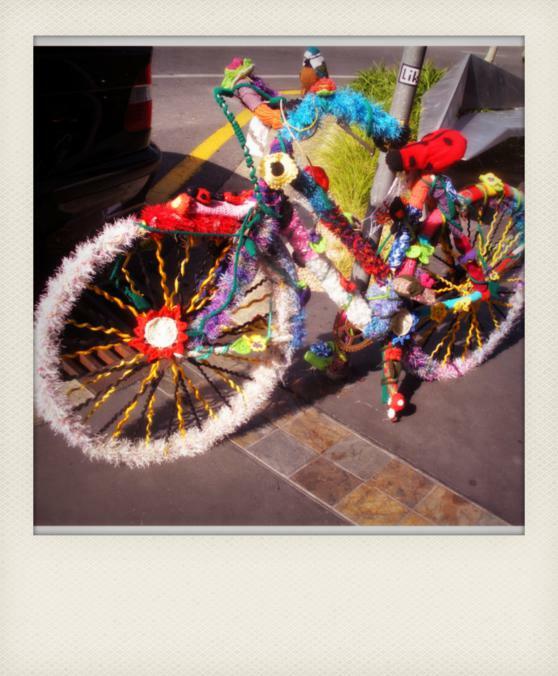 This bike in a tree is really clever & a totally unique yarn bomb. 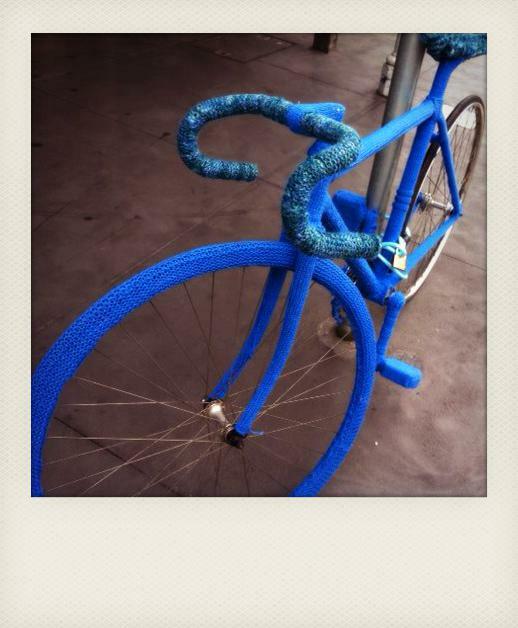 I call this the BLUE MAN BIKE. 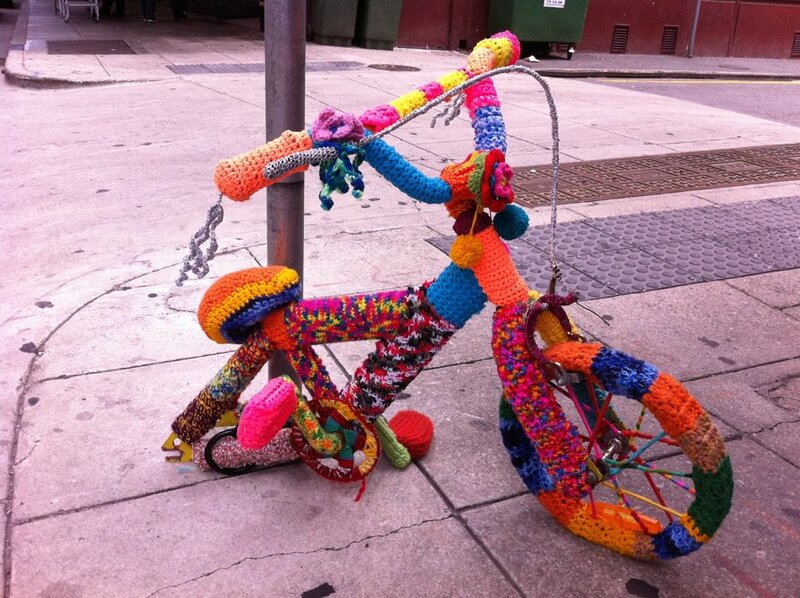 Clearly nobody wants a soggy yarn bomb on their bike, so here’s the answer! 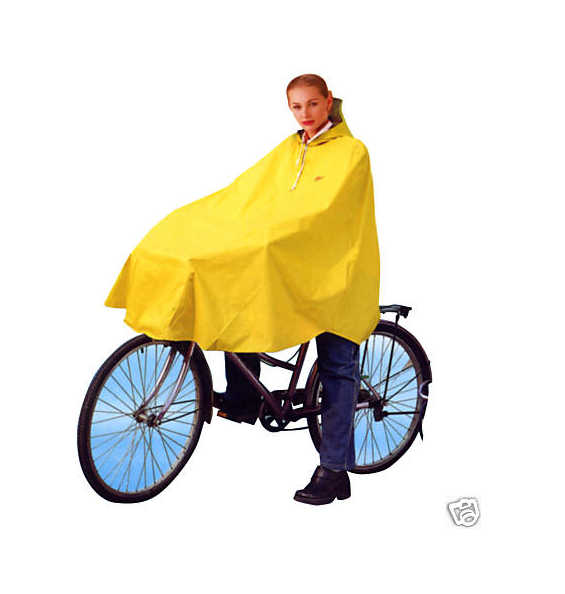 I spotted this stylish little bike poncho on ebay. 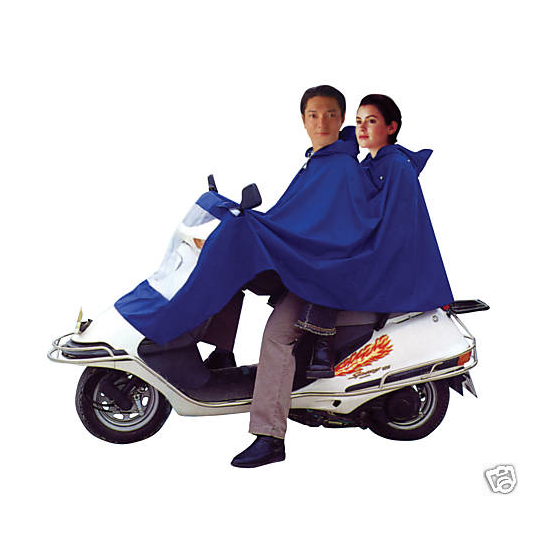 This fabulous blue man poncho gives rain protection not just to you and a loved one but also to your hotted up scooter. 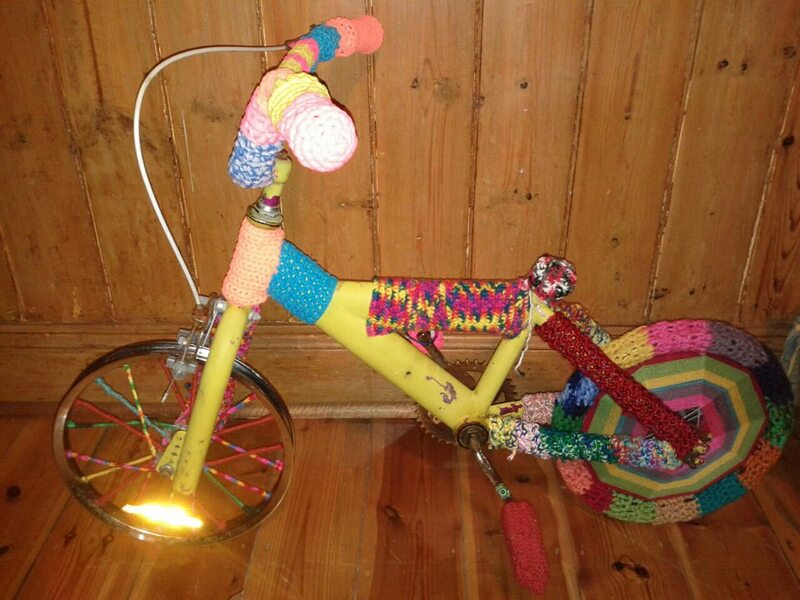 This entry was posted in Yarn bombing and tagged bike, crochet, knitting, yarn bombing on March 27, 2012 by yarnbomb. 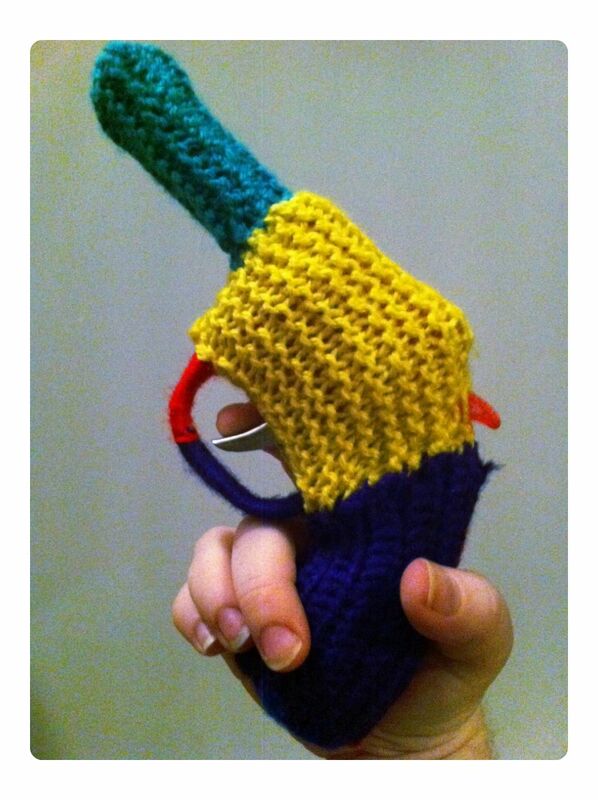 I usually don’t like guns but they are adorable when you encase them in knitting. 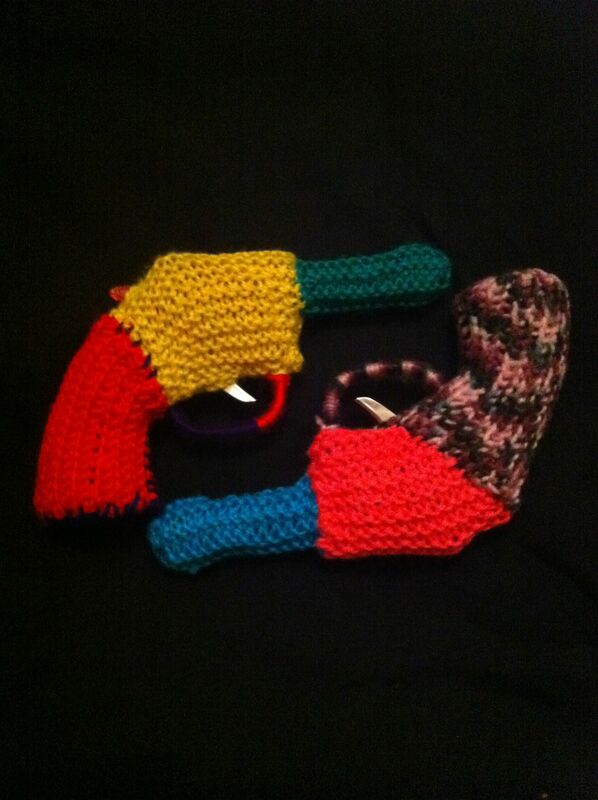 I yarn bombed these plastic guns using a combination of knitting & crochet. 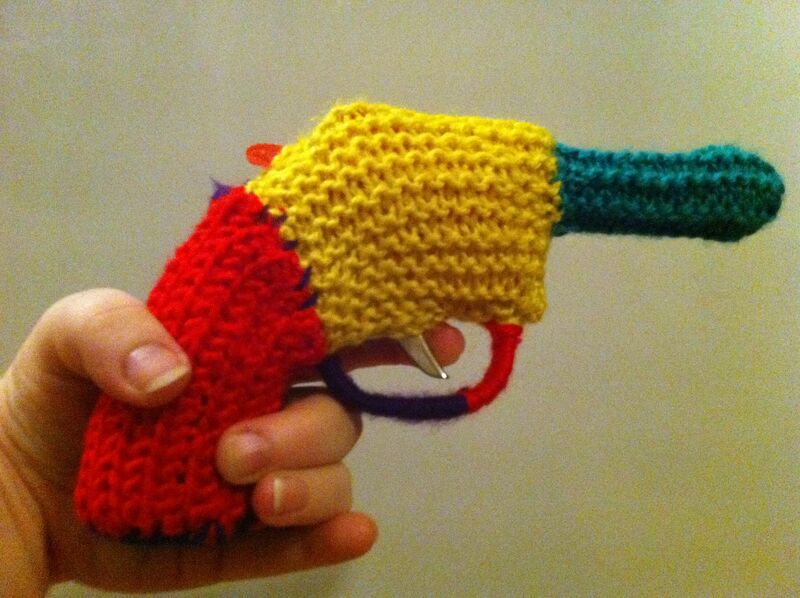 I love the contrast of squishy knitted yarn in contrast with the hard surface of the toy guns. 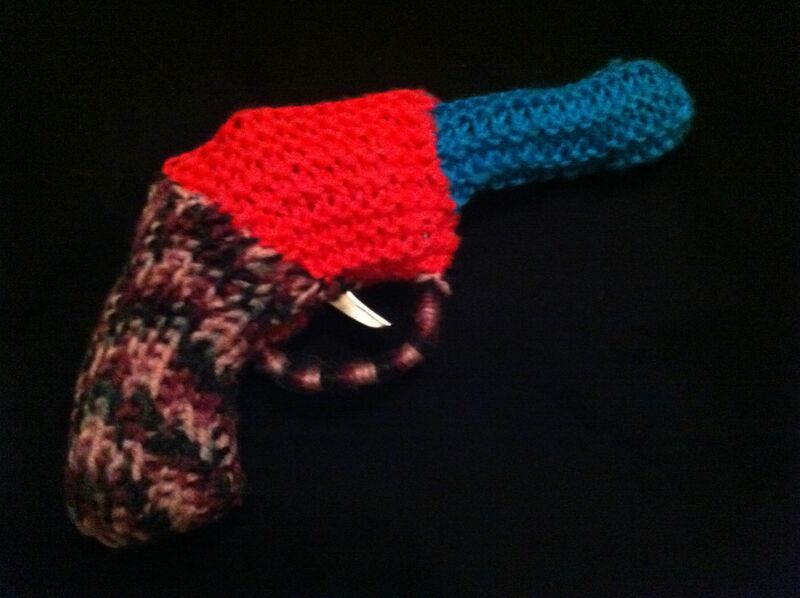 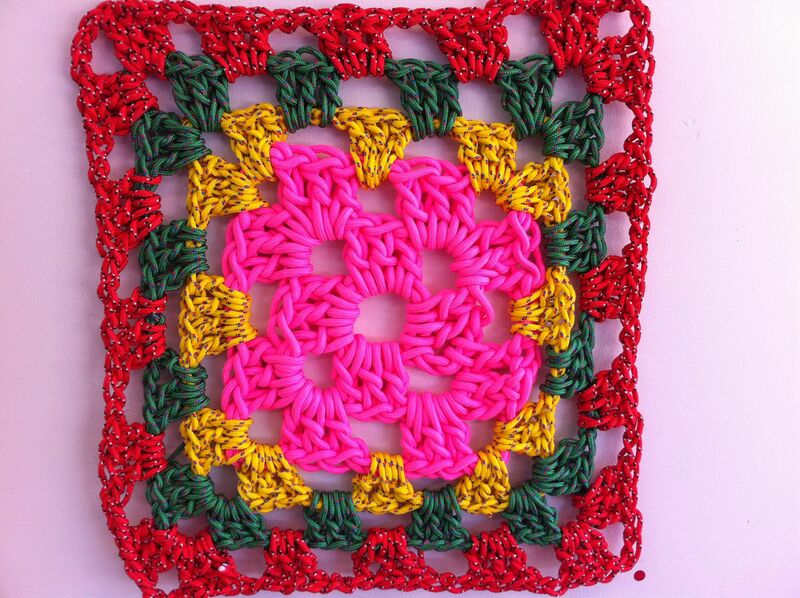 This entry was posted in Yarn bombing and tagged crochet, knitting, toy gun, yarn bombed on March 26, 2012 by yarnbomb. This brilliant yarn bombed bike has a fantastic feline feel with a cat face, ears & tail. 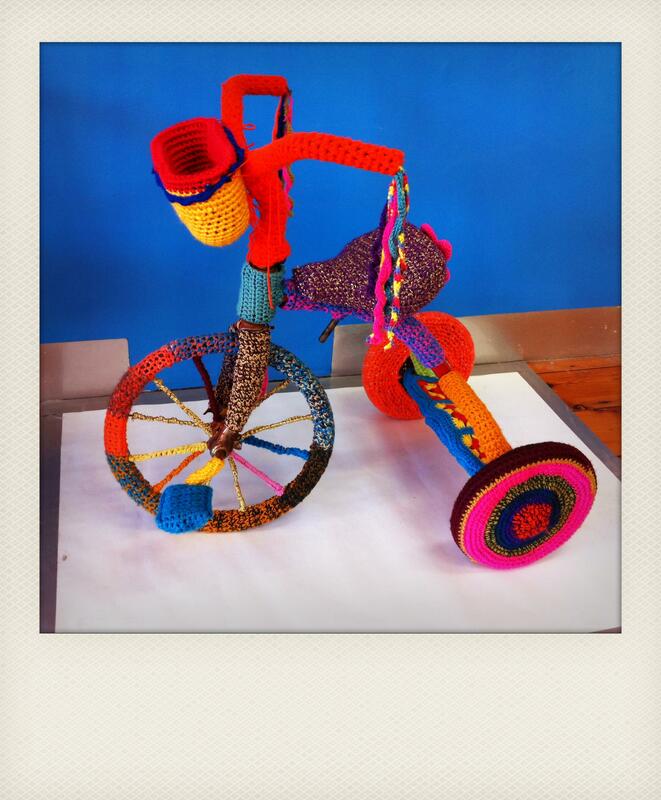 This knit bombed bike was created for the SA bike art exhibition which took place in adelaide australia in january. 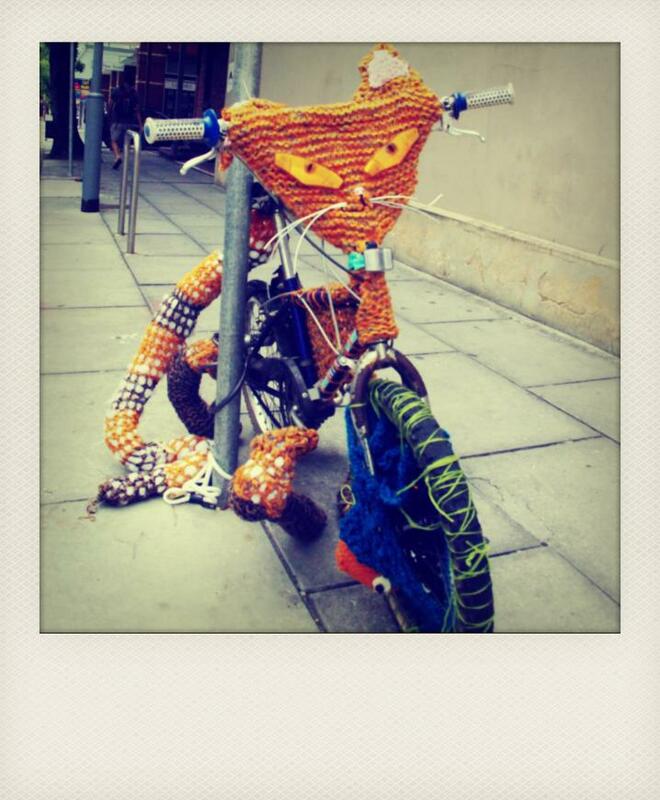 The eyes on this cat are made from wheel reflectors. 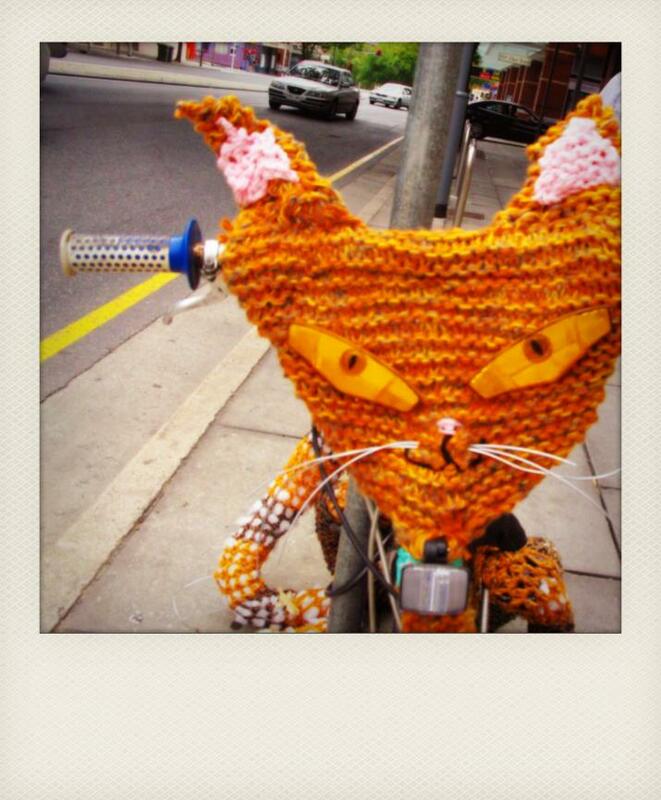 This entry was posted in Uncategorized and tagged bike, Cat, knit bombed, yarn bomb, yarn bombed on March 21, 2012 by yarnbomb. 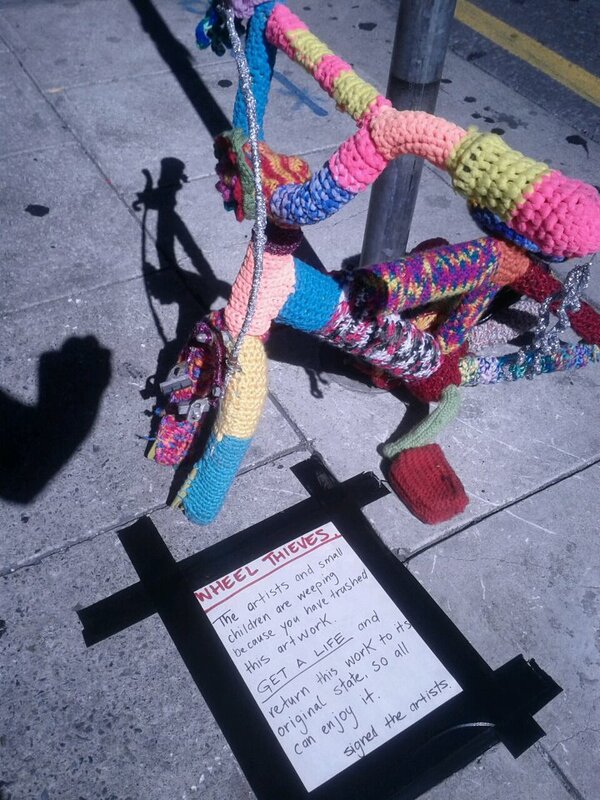 This yarn bombed street sign is brilliant but I wonder how long it took for the city council to remove it. 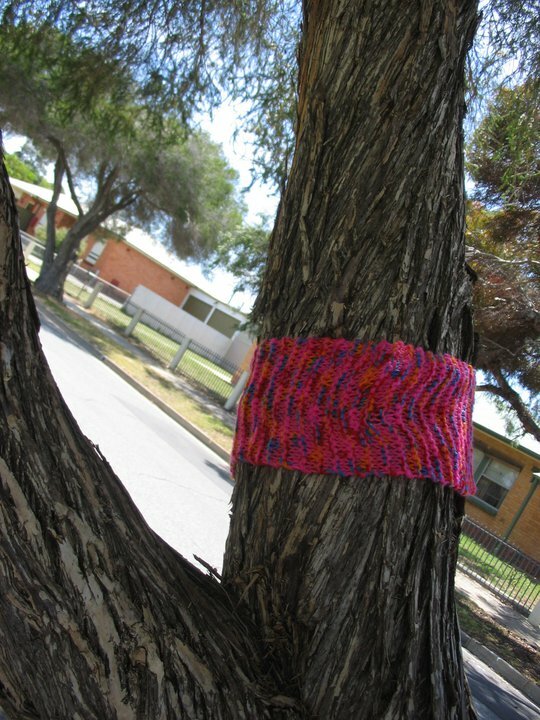 This yarn bomb has been on a tree in a suburban street near me for about six months, some kids have moved it up & down the branch but otherwise it remains intact. 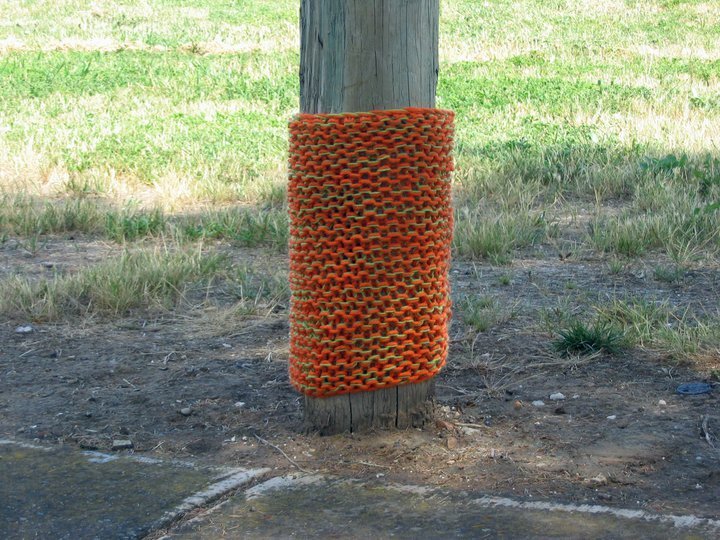 This lovely yarn bombed pole was at the edge of a park in my suburb. 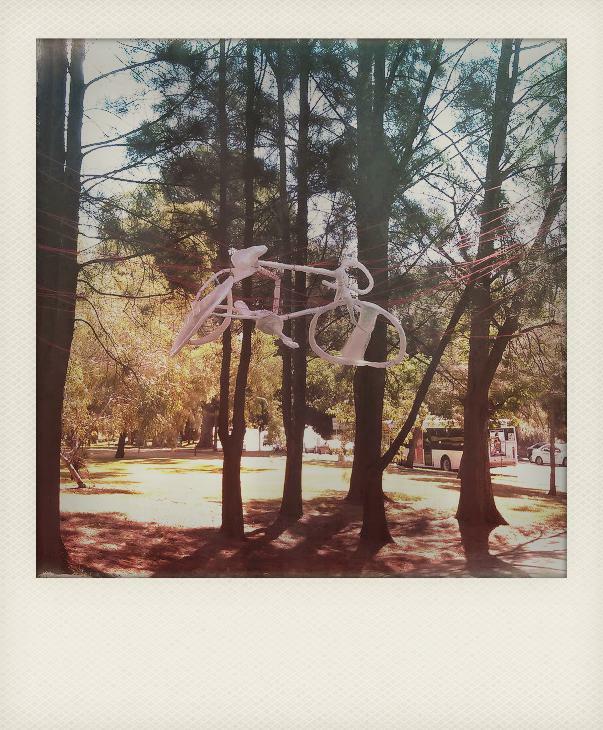 It stayed for a few weeks until someone shimmied it up the pole & peeled it off. 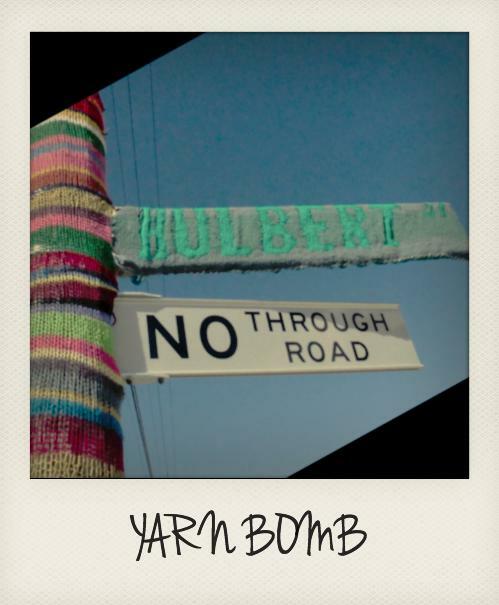 This entry was posted in Uncategorized and tagged suburban yarn bombing, tree, yarn bomb on March 5, 2012 by yarnbomb. 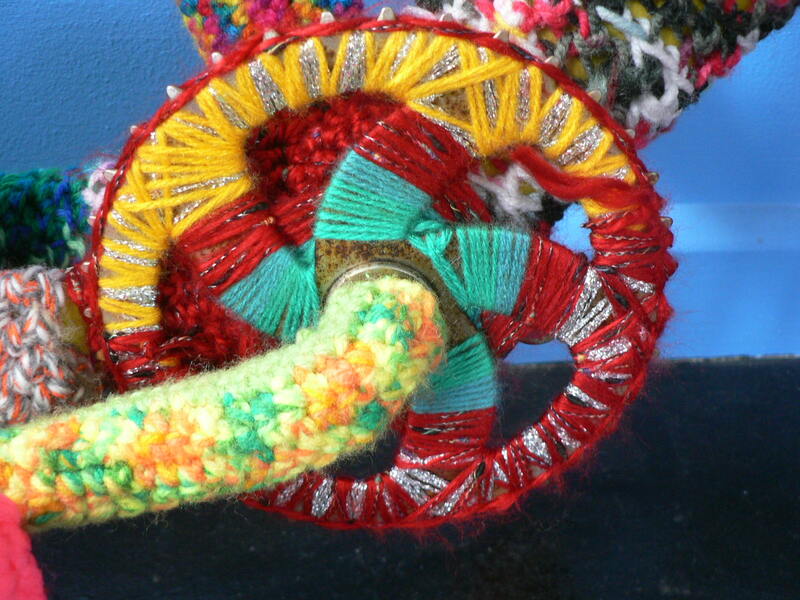 This yarn bombed rocking chair is still a work in progress however it is progressing really fast now. 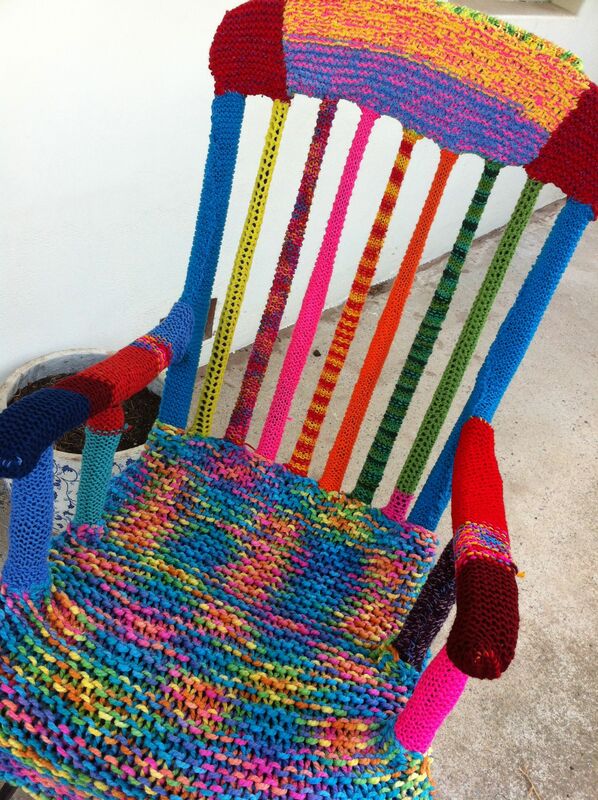 The chair is covered primarily with knitting & a little crochet. 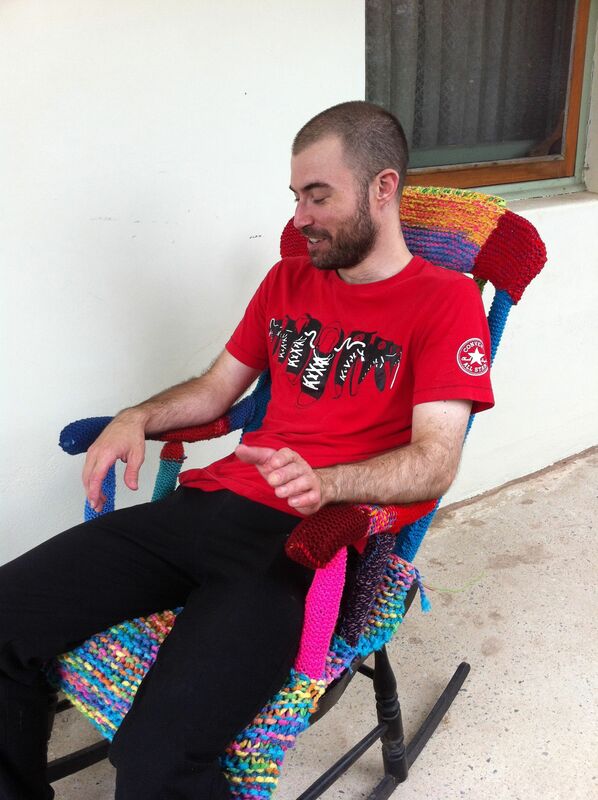 The chair lives on the verandah & rocks when its windy. 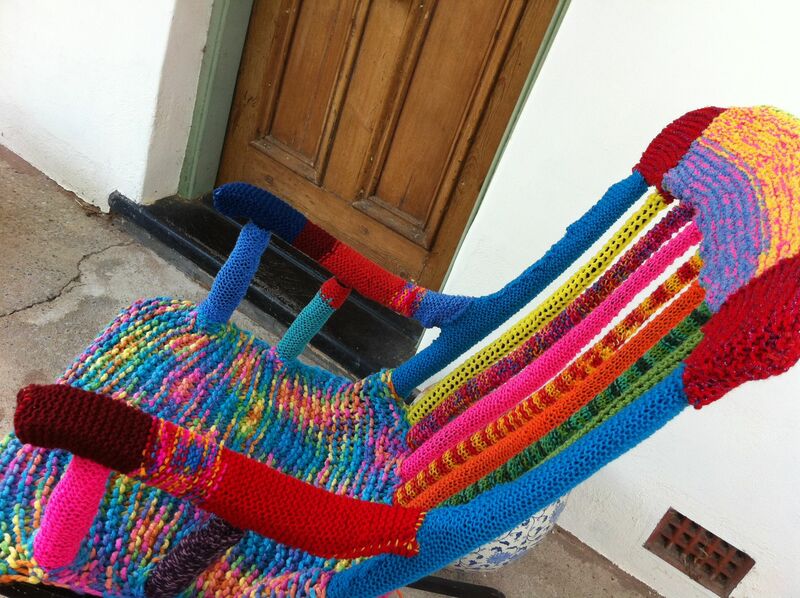 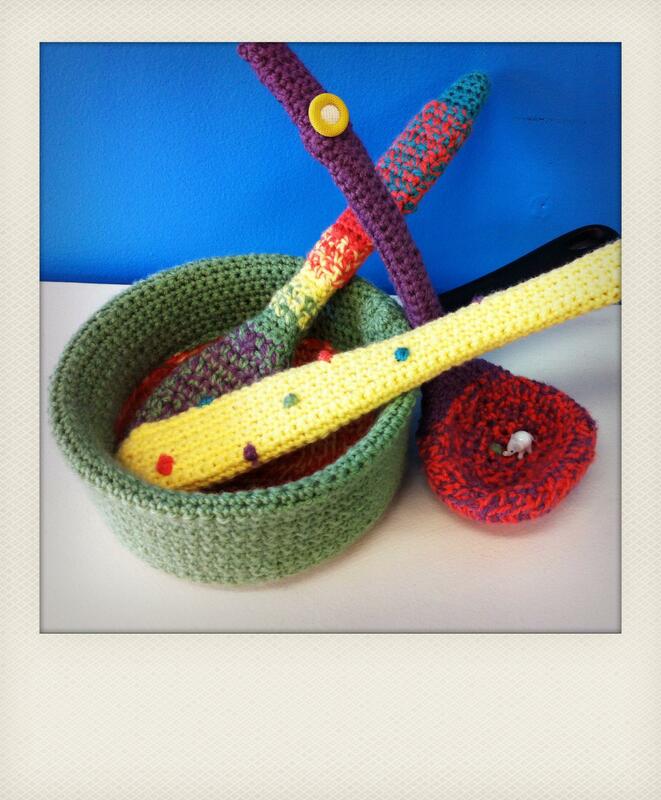 The rocking chair is solid wood under the festival of coloured yarn. 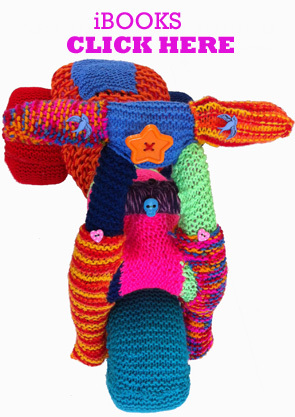 The chair looks different from every angle because of the mix & match colours on the arms & spokes. 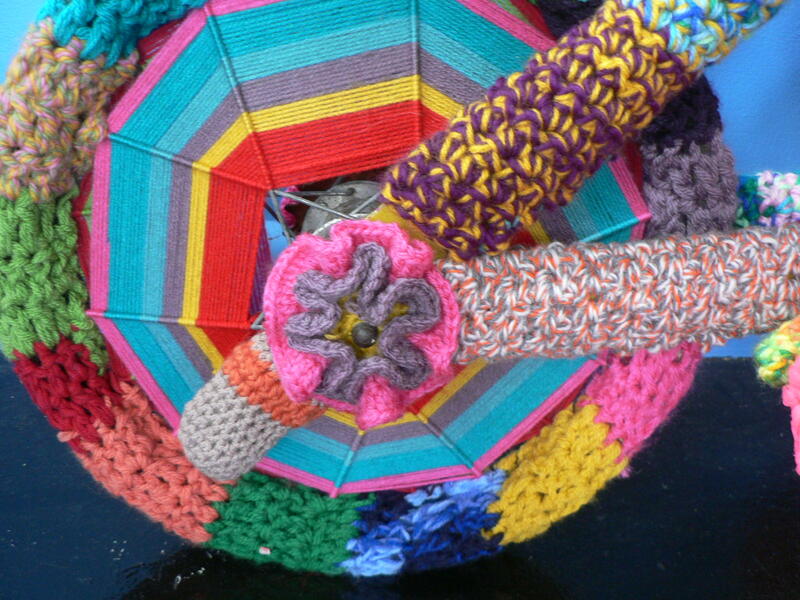 The texture of the yarn brings an extra dimension to the chair. The brighter yarns tend to be polyester blends while the earth tones are more likely to be sheep’s wool. 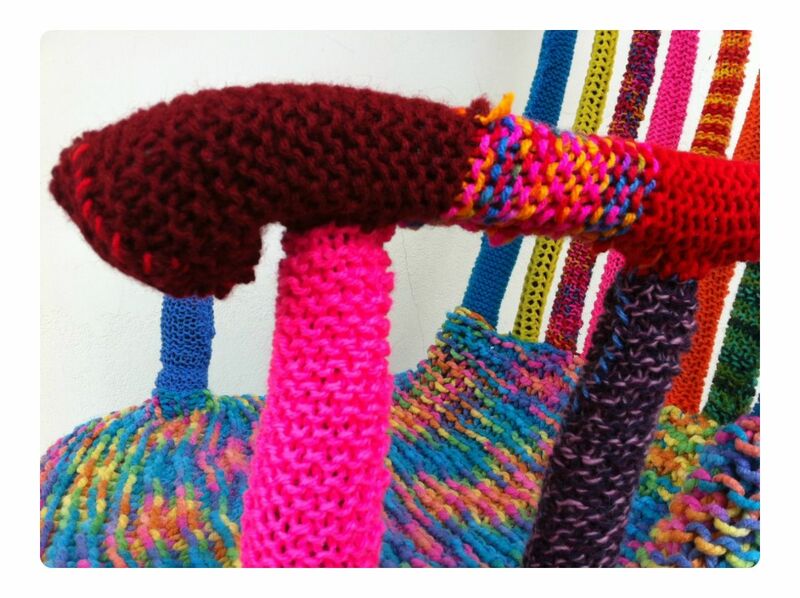 The knitted pieces are moulded around the chair arms, seat etc & hand stitched into place. 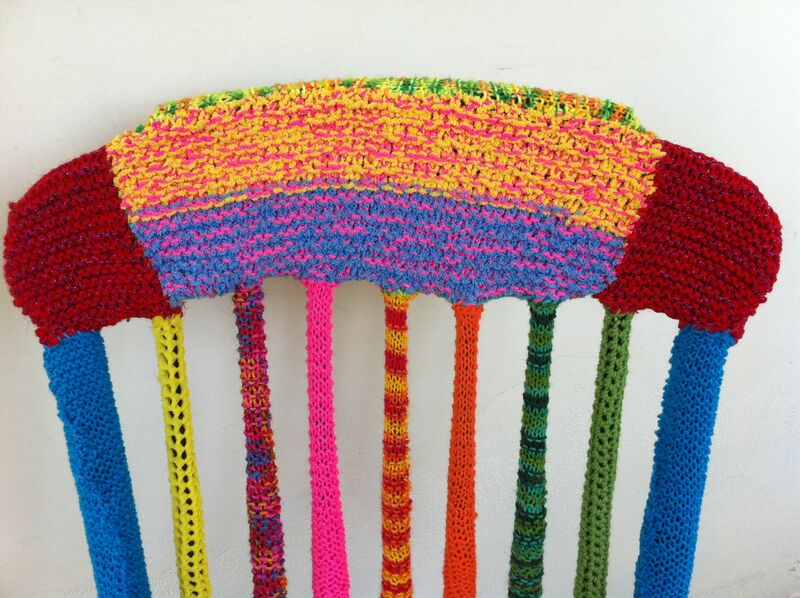 The chair is soooo much more comfortable to sit on than a plain wood finish chair because the knitted pieces pad it out so nicely. 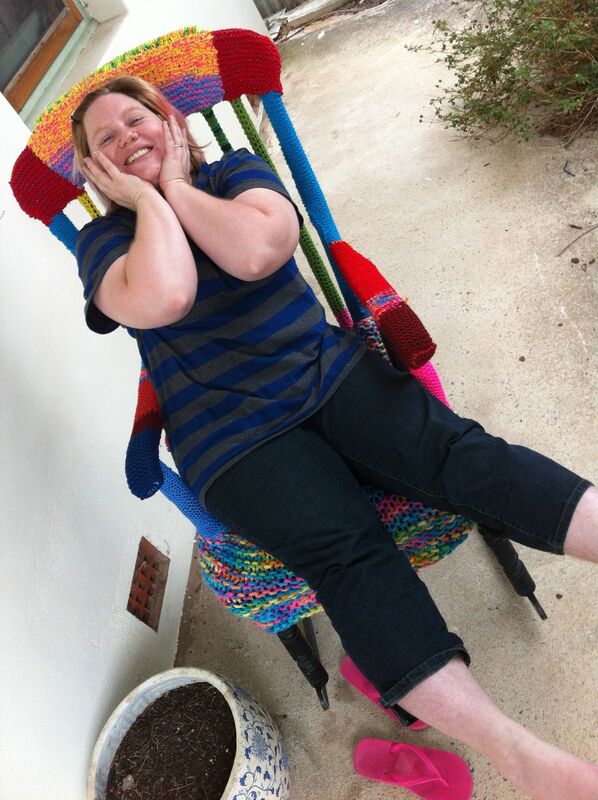 I’m so excited by this chair that I have just bought one more from the local used furniture store so I that I can yarn bomb a second one, I even felt bold & negotiated a better price for cash. 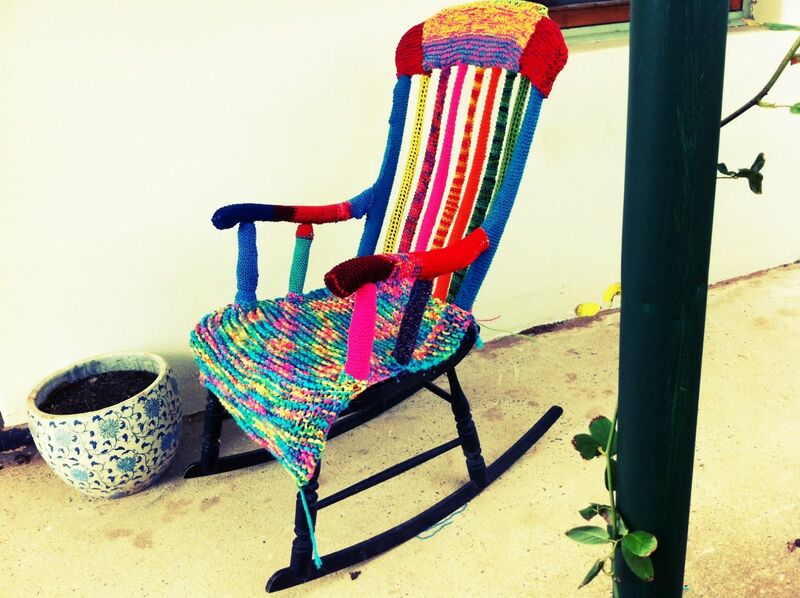 This entry was posted in Yarn bombing and tagged knitting, rocking chair, yarn, yarn bomb on March 2, 2012 by yarnbomb.